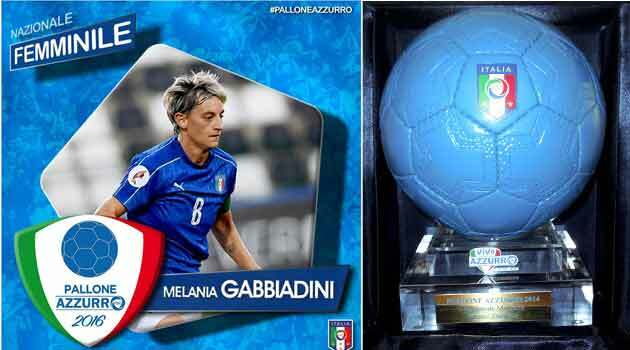 Melania Gabbiadini "Blue Ball 2016"
The captain of Verona and the national team won the prestigious award winning the poll of the official website of the FIGC "Vivo Azzurro"
The fans have elected the best Azzurri of 2016. The "2016 Blue Ball" win: Gianluigi BUFFON (National Male - 38 years, goalkeeper), Melania GABBIADINI (National Women's - 33 years, forward), Gabriele GORI (National Beach Soccer - 29 years, forward), Stefano MAMMARELLA (National of Futsal - 32 years, goalkeeper). The four winning athletes will receive the "Blue Ball" at the first meeting of their respective national teams. The survey was held on www.vivoazzurro.it, official FIGC site of the Italian National Soccer Team, and involved almost 15.000 users, who voted for the 20 candidates (5 for each national team), chosen by the journalists of the RAI Sport editorial staff, following the blue teams during the 2016. Read more: Melania Gabbiadini "Blue Ball 2016"
The fans have elected the young fantasist Manuela Giugliano (Mozzanica) as the best Azzurra of 2015. Giugliano preceded Matina Rosucci and Melania Gabbiadini. Together with the young blue promise were elected Marco VERRATTI (National Male - 23 years, midfielder), Simone DEL MESTRE (National Beach Soccer - 32 years, goalkeeper) and Alex MERLIM (National Futsal - 29 years, lateral offensive). 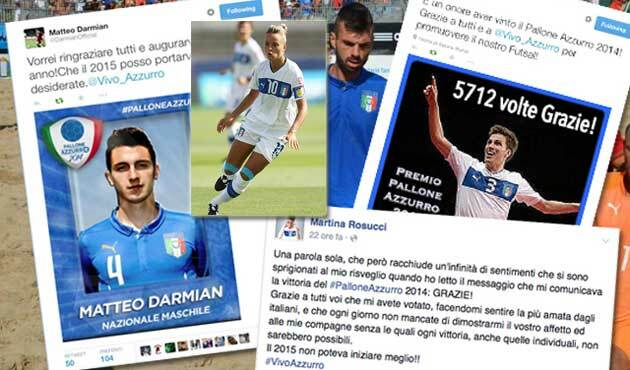 The survey was held on www.vivoazzurro.it, official FIGC site of the Italian National Soccer Team, and involved almost 20.000 users, who voted for the 20 candidates (5 for each national team), chosen by the journalists of the RAI Sport editorial staff, following the blue teams during the 2015. Our editorial team wishes Manuela Giugliano to continue to delight us with her football fantasies and to grow with the humility and professionalism necessary to become a great player. Martina Rosucci is the most loved by Italians. The Italian national number 10 player won the 2014 Blue Ball, ranking first in the fans' preferences in the FIGC poll on the VivoAzzurro community. "It is a tremendous emotion to receive this award," commented the Italian 10 number - I did not expect to win and to do so with such a wide preference. Being the most loved by Italians? A wonderful feeling that I feel every day with the many messages that come to me on social networks, but also a responsibility. However, I am happy that this award arrives in the year in which my hometown, Turin, is the European Capital of Sport; it's a small way to make my contribution to the cause, without forgetting that for the men's national team, Darmian of Turin won, it's almost an en-plein for the city ".